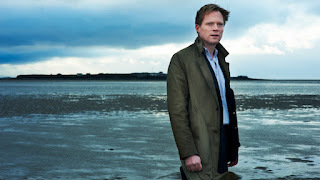 BLOOD is a disappointingly British mediocre crime thriller that would perhaps be better suited to the small screen, similar to one of those two hour episodes of an Inspector Rebus novel. Every action, every moral disintegration, and much of the dialogue is predictable and the only saving graces are the performances from supporting actor Brian Cox and the vivid, elegant cinematography from DP George Richmond (WILD BILL). Paul Bettany and Stephen Graham plays brothers Joe and Chrissy, both cops in a northern seaside town, growing up on self-aggrandizing tales of harsh policing from their father (Brian Cox), now suffering from Alzheimers. As the movie opens, they have arrested a former sexual offender for the brutal murder of a young girl, about the same age as Joe's own daughter. The man's refusal to confess prompts a drunken Joe to go "Rampart" and the remaining hour sees the consequences of this turn to the dark side of policing. Screenwriter Bill Gallagher has a long background in TV drama, notably schmaltzy costume dramas like LARK RISE TO CANDLEFORD and THE PARADISE. BLOOD may be a contemporary cop thriller but it has the same air of inauthenticity and contrivance. This isn't helped by the casting: it would take a far more engrossing film to force us to suspend our disbelief that Brian Cox, Paul Bettany and Stephen Graham come from the same family given their differing physique and regional/class accents. There are other directorial choices from Nick Murphy (THE AWAKENING) that seem odd. Why set the police department in what looks to be an ornate ex Church or City Hall, for instance? I found the too polished production design deeply at odds with what was evidently trying to be a serious psychological drama. The two lead performances are also deeply unsatisfying. A classic example is when Joe receives some bad news and does that cliché thing of crumpling to the floor, raising two hands to his face. Overall, a disappointing second feature after last year's festival début That said, I suspect this is down to the casting and script, which suggests that, tied to a better quality project, Nick Murphy could still do good things. BLOOD played London 2012. The running time is 87 minutes.